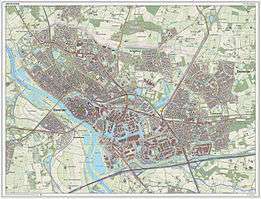 Deventer (Dutch pronunciation: [ˈdeːvəntər]) is a municipality and city in the Salland region of the Dutch province of Overijssel. Deventer is largely situated on the east bank of the river IJssel, but also has a small part of its territory on the west bank. In 2005 the municipality of Bathmen (pop. 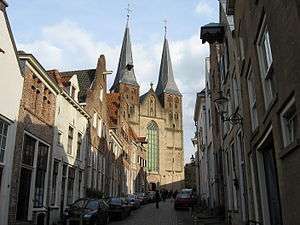 5,000) was merged with Deventer as part of a national effort to reduce bureaucracy in the country. Deventer is the birthplace of Geert Groote and home to his Brethren of the Common Life, a school of religious thought that influenced Thomas a Kempis and Erasmus in later times. Together with Haarlem it was among the first cities to have printing presses, dating back to as early as 1477. From around 1300, it also housed a Latin School, which became internationally renowned, and remained in service in changing forms until 1971. Its most famous pupil was the scholar Desiderius Erasmus, who was born in 1466 and attended the school from 1475 to 1484. 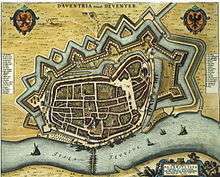 Between 1500 and 1800, the mass of water flowing through the IJssel decreased, decreasing the importance of Deventer's harbour. 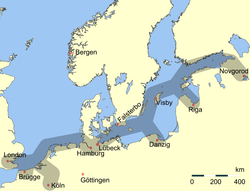 The competition with trade centres in Holland, as well as the religious war between 1568 and 1648, brought a decline in the city's economy. The city's trade and industry is still of some importance. The city is host to a factory producing central heating systems, as well as Wolters Kluwer, a large global information services and publishing company. Deventer has seen few military engagements throughout its long history, although it was a garrison city of the Dutch cavalry. The industrial area and harbour were bombed heavily during World War II. The city centre has been largely spared, thus offering a view that has remained largely unchanged for the past few centuries. Deventer has been somewhat popular with the film industry. During the production of the 1977 film A Bridge Too Far, all of the scenes taking place in nearby Arnhem were filmed in Deventer - as Arnhem itself had lost its historic center. On the outer wall of the Waag hangs a large kettle that is over 500 years old, said to have been used for a public execution in the late Middle Ages; a man who had produced counterfeit coins was cooked to death in it. According to local tradition,There are holes in the kettle shot by footmen of Napoleon's army around 1809. The Saint Lebuïnuskerk (St. Lebuin's Church) in Gothic style, with remarkable ceiling paintings and a beautiful organ. Its tower can be climbed in summer. The Brink (market square) with houses, shops, and cafes dating from 1575-1900. The market square is also the center of Deventer nightlife. Alongside this square there is the Bussink "Koekhuisje", where you can buy the famous Deventer Koek (honey-cake). Markets take place every Friday (including a very big one on Good Friday, following a medieval tradition) and Saturday. The Speelgoedmuseum (Toy Museum) behind the Waag, housed in one of the most picturesque old houses of the city. The picturesque and old streets around the Bergkerk, known as Bergkwartier (Mountain Quarter) situated on and around an old river dune. Deventer is the home of professional Football club Go Ahead Eagles, who are housed in stadium De Adelaarshorst. De Adelaarshorst is situated in a typical 1930s neighbourhood and one of the oldest stadiums still in use today. The club was founded in 1902 as Be Quick, although the name was soon changed to Go Ahead at the request of the Dutch Football Association. The suffix Eagles was added in 1971, following a suggestion from the then coach, Barry Hughes. Go Ahead Eagles has been the club of Marc Overmars, Paul Bosvelt, and Bert van Marwijk, whilst providing Henk ten Cate and Leo Beenhakker with their first experience of management. The 1992 founded skating rink De Scheg, which is semi-indoor since 2011, is in the top 10 of fastest skating tracks of the Netherlands. It is and was the training accommodation of many great skaters, among which Olympic champion Mark Tuitert and the retired former world champion sprint Erben Wennemars. Deventer also houses a great number of watersports clubs, due to its situation on the banks of the river IJssel. In the first weekend of July, the city centre is the scene of the spectacular open air festival "Deventer op stelten" (Deventer on Stilts). Actors and artists give free performances in the streets and on the Brink square. All actors must use stilts during their acts. In August, Deventer is home to Europe's largest book fair, attracting some 125,000 visitors. The Dickens Festival in December sees some of the oldest streets and alleys in the city dressed up in the style of the Victorian era, as per Dickens' writings. 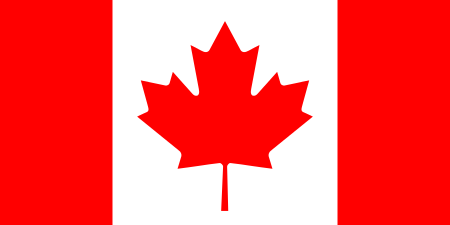 The latter attracted 135,000 visitors in 2004 and 2006. 1 2 "Twin Cities of Tartu". ©2007 City of Tartu. Retrieved 2009-01-04.